Cerebral Palsy (CP) is a disorder that stems from injury to the parts of the brain that control motor movements. This means that a child with cerebral palsy has difficulty controlling the muscles in his/her body, may have limited motor skills, speech difficulties, and/or decreased cognition and learning disabilities. Estimates suggest that 50% of children diagnosed with cerebral palsy have some form of vision deficit. The injury may happen before birth, during delivery, or in the months after birth. Approximately 500,000 people in the United States have some form of cerebral palsy. Ataxic cerebral palsy affects balance and depth perception. Children with ataxic cerebral palsy have poor coordination of their movements and have tremors or "shakiness" when engaging in fine motor tasks such as writing. Some children with this type of cerebral palsy also have low muscle tone. This is the rarest type of cerebral palsy, occurring in less than 10% of all cases. Even though two children might have a diagnosis of cerebral palsy, their abilities and needs may be very dierent from one another. Speech therapy (ST) — This helps the child develop his/her communication skills by improving specific language and articulation skills and/or providing alternative methods of communication such as a communication device. Physical therapy (PT) — This helps the child develop stronger muscles in the body for sitting, walking, and keeping his/her balance and/or providing adaptive equipment to assist the child with sitting, walking, and balance. Occupational therapy (OT) — This helps the child to participate in everyday activities such as dressing, eating, playing, and doing schoolwork by improving specific skills such as fine motor skills and/or providing adaptive equipment and techniques to increase a child's independence. Medical intervention includes medication to control tone and surgical intervention to release tight muscles and fixed joints. The multiple disabilities that accompany cerebral palsy can interfere with a child's ability to participate in everyday tasks such as play. Finding appropriate and stimulating toys for children with CP can sometimes be difficult. Toys that concentrate on what the child can do rather that what he/she can't promotes positive participation and may help decrease frustration. Often children with cerebral palsy benefit from materials that have been adapted to require less manipulation, such as switch adapted toys. 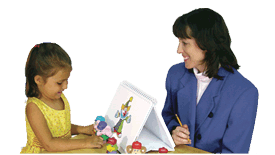 Consult with your therapist to help you determine what toy or adaptations best meet your child's specific needs. More information on cerebral palsy is available at United Cerebral Palsy http://www.ucp.org/ .